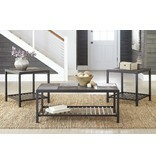 Item Description: As the Chelner coffee table set proves, you can be both down to earth and ultra cool. Tabletop “tiles” are crafted with solid pine wood, set in an alternating grain pattern for added character. Tubular metal base with slatted shelf and industrial fittings is sleek, linear and highly contemporary. Series Features: Made with tubular metal and finished in a textured bronze and black powder coat finish. 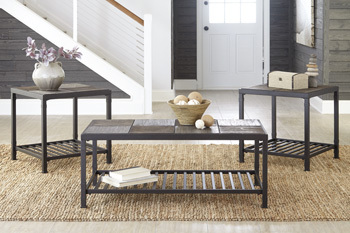 Table top has tiles made from solid Pine finished in a textured gray color.